Yokogawa Meters & Instruments Corporation announces that it has developed the DL350 ScopeCorder and will be releasing it for sale on June 13. Combining the strengths of an oscilloscope and a data recorder, the all-new DL350 features a built-in battery and a lightweight, space-saving design. The DL350 ScopeCorder offers the same high reliability and precision as the high-end DL850E and DL850EV models, yet is optimized for the performance testing and troubleshooting of products and equipment in the field. The addition of this new product to our recording instrument lineup meets the need for a highly capable, yet portable recording instrument and gives our customers a wider range of products to choose from. Yokogawa's DL850 ScopeCorders are highly reliable and precise measurement instruments with outstanding noise resistance and the capability to measure and record a variety of signal types received via multiple channels over long periods of time. They are typically used to measure signals from inverters, which are key elements in energy saving systems, and for analyzing signals from automotive electrical and control systems. Since their release in 2010, the DL850 and DL850V and the succeeding DL850E and DL850EV models have entered wide use in the development of high performance and energy efficient products ranging from electrical and electronic equipment to automobiles. While the DL850 series instruments are primarily used in laboratories, the DL350 was developed to meet the rising need for a highly reliable and precise instrument that can be used to perform tests and troubleshooting in the field. 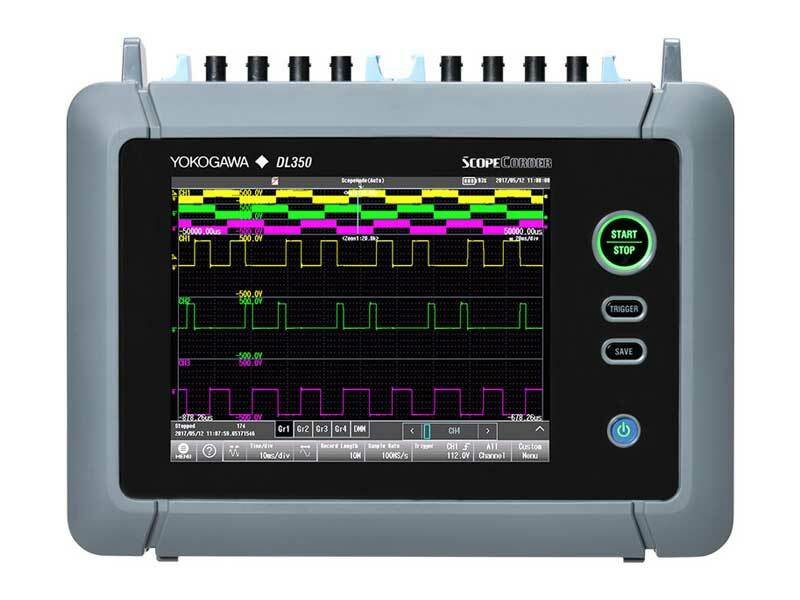 With the portable DL350 ScopeCorder, Yokogawa offers the same high level of reliability and precision in the measurement of different signal types currently possible with the DL850E and the DL850EV. The DL350 is a light and compact instrument that weighs just 3.9 kg, half that of the higher-end DL850E/DL850EV, yet achieves the same high reliability and precision as these models because it uses many of the same plug-in modules. Moreover, the DL350 can run off its own internal battery, and is thus well suited for use in field locations where AC power is not available. When high reliability is required for testing in the field, small data logging instruments and oscilloscopes have often been used. However, the data loggers lack the ability to measure and record rapidly changing waveforms, and the oscilloscopes accept only voltage signals and cannot continuously record data for long periods. For long periods of time, the DL350 can measure high-speed changes in voltage, temperature, strain, acceleration, frequency, and in-vehicle serial communication signals (CAN, LIN, and SENT) using a wide variety of plug-in modules, and up to 50 days' worth of data can be stored when using both its large internal memory and an SD card. Thanks to its modular design, the DL350 can be easily modified to handle different signal types, depending on the measurement application. For vehicle testing, the DL350 has a global positioning system (GPS) function that enables location, speed, time, and other data to be correlated with waveform data collected during vehicle road tests. In keeping with our emphasis on ease of use in the field, the DL350 comes with an intuitive touch-screen interface and can be easily switched to operate in either recorder mode or oscilloscope mode. For added work efficiency, PC software is also provided for editing device configuration files, implementing settings on the main device, and backing up data. The major feature of the ScopeCorder is its ability to observe physical signal outputs over extended periods of time, and it is particularly useful in mechatronics related development activities, where a great emphasis is placed on noise-proof performance. The ScopeCorder is both an oscilloscope that can capture rapid events and a data recorder that can record trends with high resolution and over extended periods of time.